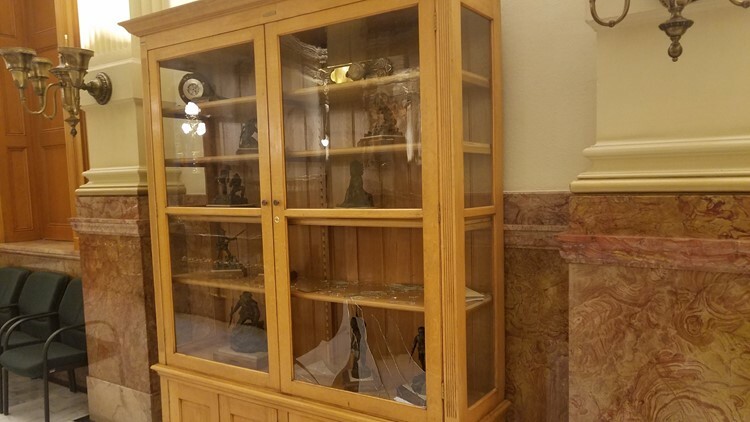 The Colorado Capitol on Broadway and Colfax Avenue had an unwelcome visitor stop in early Sunday morning and cause damage to several busts of politicians inside, according to the Denver Police Department. 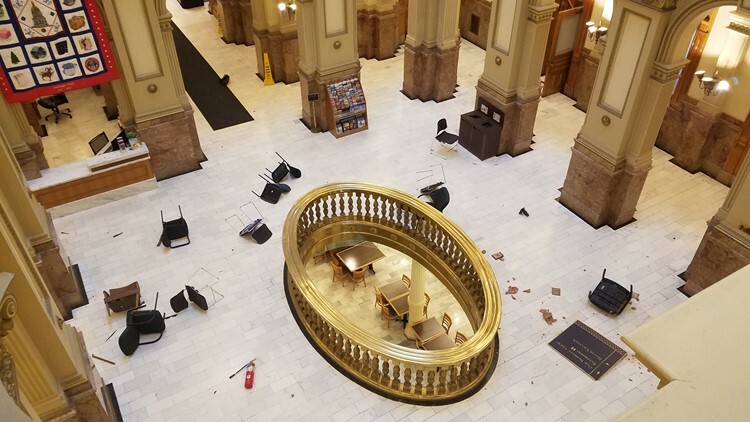 DENVER — Denver police officers are on the lookout for a suspect believed to have broken into the state Capitol overnight into Sunday and damaged several busts therein. According to the Denver Police Department, law enforcement found out about the break-in after a fire alarm call to the Denver Fire Department - despite there being no fire. Police said it's unclear how the suspect broke in; no information about the suspect was made available as of this writing. No one is in custody for the vandalism at the Capitol. Communications Director Adrian Schulte elaborated on the damage in an email to 9NEWS on Monday afternoon saying floors, busts, lighting fixtures, plaster and a cabinet were all damaged in the incident. Glass was shattered on the face of a large cabinet located outside the south staff entrance to the House of Representatives on the second floor. The cabinet was recently relocated from a History of Colorado storage facility to the Capitol, according to Schulte. A small sculpture inside the cabinet was thrown from the second floor to the first floor of the Capitol. Schulte said the sculpture itself was not damaged, but that the base of it was destroyed. 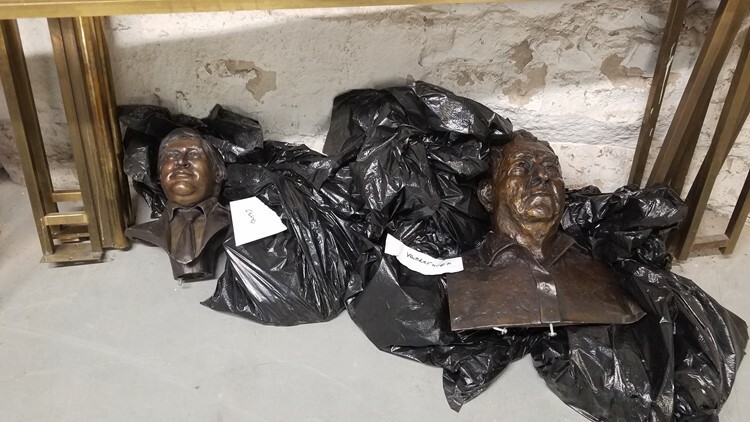 Three large busts that were placed in the second floor niches surrounding the Capitol's Grand Staircase were all thrown to the ground. Two busts landed on the first floor and were damaged at the base. A third bust was thrown to the floor but, according to Schulte, was too heavy for the vandal to to get it down to the first floor. The third bust has been returned to its niche undamaged. Marble flooring on the north and south side of the first floor were damaged from chairs, busts and sculptures thrown down from the second floor, Schulte said. Most of the damage is scratches, but there are also some gouges in the marble. Plaster and scroll work on a ledge between the first and second floor were also damaged due to the items that were thrown. 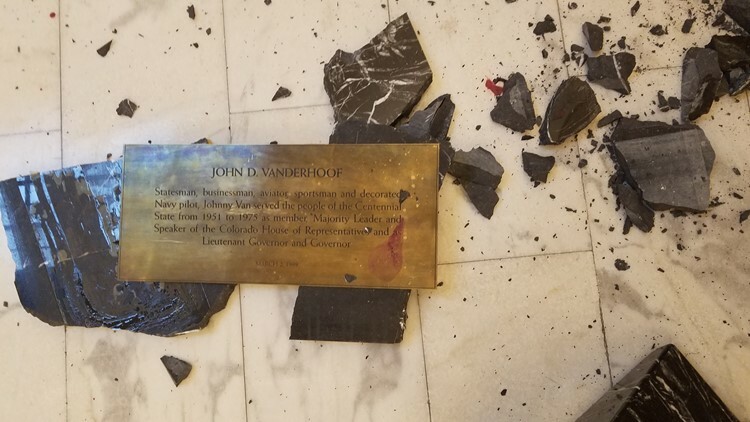 A large piece of rose onyx was chipped off the wall outside of the Senate Majority offices. 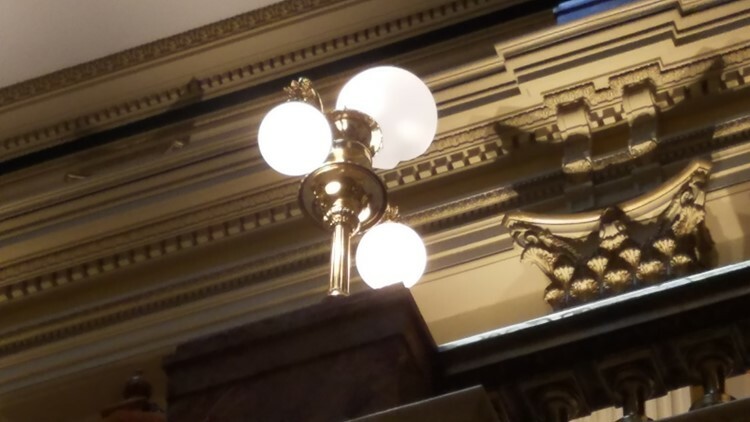 A light fixture was bent and a glass globe was broken near the landing outside the Old Supreme Court Chamber. Schulte said the city is still assessing the damage costs associated with the vandalism.